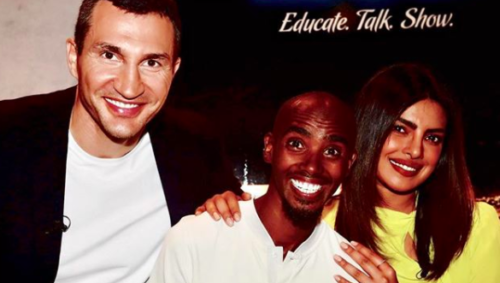 Sportspersons and celebrities crossed paths at the Global Education and Skills Forum held in Dubai on Sunday. Among the notable actors to grace their presence were Gina Torres, Sarah Rafferty and Priyanka Chopra. On the other hand, Lewis Hamilton, Wladimir Klitschko and Mo Farah were some of the bigwigs from the world of sport to be present at the occasion. After the summit, the personalities posed together for the shutterbugs as Chopra, a Bollywood and Hollywood star, took to her official Instagram account to share a few of her pictures with sporting heroes. 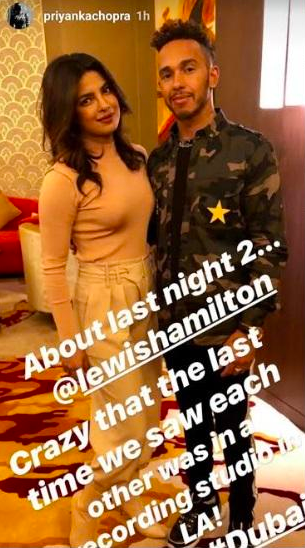 Posing alongside Formula One superstar Lewis Hamilton, she wrote: “About last night @lewishamilton. Crazy that the last time we saw each other was in a recording studio in LA. Chopra, who won the Miss Universe beauty pageant back in 2000, also posed alongside retired boxer Wladimir Klitschko and multiple Olympic gold medallist runner Mo Farah. “Two guys, a girl and a conversation! When you are in the company of two world class athletes, you’re guaranteed to walk away feeling like you can do and achieve anything. From comparing fist sizes to the crucial need for quality education around the world…we covered it all at the @gesforum. Awesome to meet you both,” she captioned the photo.